You’ve probably had a blister on your foot at one time or another. We all have. All it takes is a new pair of shoes that you decide to wear to work for the day to break them in, and bam a few hours later you’ve got a blister! Or maybe you decide to wear that favorite pair of shoes — without socks — and suddenly you discover that your favorite shoes are rubbing you raw. However you get them, blisters are a fact of life. So that means that if your foot gets hot and starts to sweat, and you’re wearing shoes that are rubbing against your skin just right, then you can get a blister. 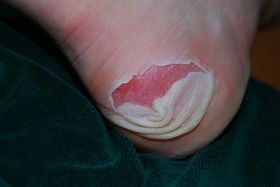 Blisters are simply a build-up of fluid between different layers of skin. A blister is created when something rubs the outer layer of skin and causes it to then rub the inner layer of skin. This, in turn, causes the outer layer to come loose from the inner layer. It is at this point that your body then fills up the space with lymph fluid. When this happens, the outer layer loses any contact with oxygen and nutrients, and at that point becomes dead skin. If you pop the blister, or it pops on its own, then your skin is no longer protected since the outer skin is dead. Personally, I always pop my blisters with a sterilized needle, drain them and then put a bandaid with antibiotic cream on them to keep them from getting infected. However, there are some people who say that you should never pop a blister. Why? Because the blister is “nature’s bandaid.” It’s thought if you pop a blister, bacteria will have contact with the unprotected skin, which leaves you open to infection. That said, there are some times when popping a blister is necessary — such as when it interferes with your being able to wear your shoes. Or, when the blister interferes with other things that you need to do in life. There are many different schools of thought when it comes to treating blisters on the feet. #1 – Only pop a blister with a sterilized needle. You can sterilize a needle by dipping the tip in rubbing alcohol. It is not suggested to put the tip of your needle into a flame because fire can oxidize anything (including coatings that are on the metal needle) and these then form a black particulate that can get onto the exposed skin beneath a blister and cause an infection later on. #2 – Don’t remove the skin from a blister once you’ve popped it. Instead leave it there, add some antibiotic cream and a bandaid. This will help to protect the skin underneath and keep the skin beneath the blister from becoming infected. #3 – Make sure the bandaid stays in place. If you’re going to be on your feet for a long time, then consider adding some duct tape over the bandaid to keep it in place. The reason? Because the adhesive on bandaids rarely holds up to sweaty feet. Bandaids on feet almost always come off! Do not put the duct tape directly onto the blister — whether it has popped or not — because the adhesive could cause an infection. #4 – Soak your blistered foot in Epsom salts and warm water. Soak for 20-30 minutes, then air dry your foot. You can do this up to 3 times a day. Epsom salts will help your foot not sweat as much. Epsom salts may also help in the prevention of new blisters. #5 – Make your own blister paste. You can make a paste by combining Preparation H (suppository kind), Vitamin E (you can break open capsules), and Bacitracin. Then, slather it on your blister. Wrap the affected area in Saran Wrap and cover your foot with a white cotton sock. The heat from the sock warms up the paste, and the Saran Wrap holds the paste on the affected area. #1 – Wear the right kind of socks. Acrylic fibers have been proven to be better than cotton fibers in preventing the frequency and severity of friction blisters in running athletes. #2 – Wear two pairs of socks. Wearing a thinner pair of knee highs underneath your socks provides a barrier for blisters since the thinner pair of socks stays in place well. #3 – Make sure you’re wearing the right shoes. Purchase shoes that do not have painful pressure points and are a good fit overall. Sometimes it’s the shoe you are wearing that is the problem. Who hasn’t found this pair of shoes that they just loved, but the store only had the size that was one half less than your normal size? Who hasn’t been tempted, and then discovered they’d made a huge mistake because there was too much friction and blisters were forming? This is why buying shoes that fit well is so important. #4 – Apply a lubricant. By lubricating your feet with things like petroleum jelly, Body Glide, Blister Shield or Sport Slick, you will help to prevent chafing. Since that’s what causes blisters to begin with, it’s in your best interest to lubricate your feet first. #5 – Rub baby powder on your feet. Do this before you leave the house. Baby powder reduces friction and eases glide. #6 – Cover blister-prone areas before you leave the house. Put bandaids or duct tape on any areas that you tend to get blisters. That way, the friction will be on the bandaid or tape instead of your skin. Make a small cut in your shoe at the pressure point to relieve some of the pressure. While this may not be the best way to have your shoes last the longest, if you are hiking and can feel you’re going to get a blister, and don’t have blister care supplies with you, this may be an option worth considering.